Climate includes patterns of temperature, precipitation, humidity, wind and seasons. "Climate change" affects more than just a change in the weather, it refers to seasonal changes over a long period of time. These climate patterns play a fundamental role in shaping natural ecosystems, and the human economies and cultures that depend on them. What is climate forcing and how does climate forcing relate to climatic variability and change? Climate forcing refers to specific phenomena that directly influence changes in climatic dynamics. Forces that influence climatic change can be broken down into those beyond the Earth's environmental system (extraterrestrial) and those that relate to internal forces (terrestrial). 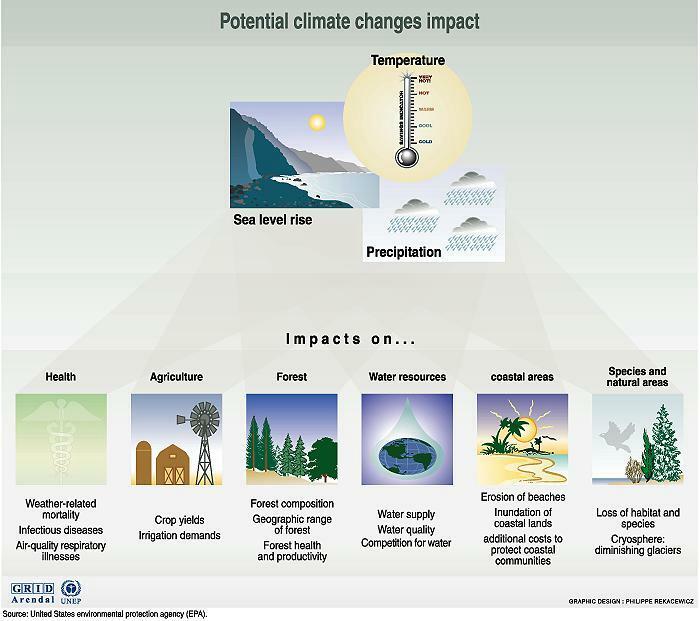 What factors are key to measuring climate change? Temperature is the primary measure of climate and can be measured or reconstructed for the Earth's surface, and sea surface temperature (SST). Precipitation offers another indicator of relative climate variation and may include humidity or water balance. Biomass and vegetation patterns may be discerned in a variety of ways and provide evidence of how ecosystems change to adapt to climate change. Sea Level measurements reflect changes in shoreline and usually relate to the degree of ice coverage in high latitudes and elevations. Solar Activity can influence climate, primarily through changes in the intensity of solar radiation. Volcanic Eruptions, like solar radiation, can alter climate due to the aerosols that are emitted into the atmosphere and alter climate patterns. Chemical composition of air or water can be measured by tracking levels of greenhouse gases such as carbon dioxide and methane, and measuring ratios of oxygen isotopes. Research indicates a strong correlation between the percent of carbon dioxide in the atmosphere and the Earth's mean temperature. The earth’s climate is predicted to change through the buildup of greenhouse gases – primarily water vapor, carbon dioxide, methane, and nitrous oxide. The heat-trapping property of these gases is undisputed. Although uncertainty exists about exactly how earth’s climate responds to these gases, global temperatures are rising. Global climate change is a change in the long-term weather patterns that characterize the regions of the world. The term "weather" refers to the short-term (daily) changes in temperature, wind, and/or precipitation of a region. Weather is the state of atmosphere-ocean-land conditions (hot/cold, wet/dry, calm/stormy, sunny/cloudy) that exist over relatively short periods like hours or days. Weather includes the passing of a thunderstorm, hurricane, or blizzard, a persistent heatwave, a cold snap, a drought. Weather variability and extreme events may respond unpredictably in response to climate change. Climate is weather patterns over a month, a season, a decade, a century from now or in past time periods. More technically climate is defined as the weather conditions resulting from the mean state of the atmosphere-ocean-land system, often described in terms of "climate normals" or average weather conditions. The greenhouse effect is a natural occurrence that maintains Earth's average temperature at approximately 60 degrees Fahrenheit. The greenhouse effect is a necessary phenomenon that keeps all Earth's heat from escaping to the outer atmosphere. Without the greenhouse effect, temperatures on Earth would be much lower than they are now, and the existence of life on this planet would not be possible. However, too many greenhouse gases in Earth's atmosphere could increase the greenhouse effect. This could result in an increase in mean global temperatures as well as changes in precipitation patterns. When weather patterns for an area change in one direction over long periods of time, they can result in a net climate change for that area. The key concept in climate change is time. Natural changes in climate usually occur over; that is to say they occur over such long periods of time that they are often not noticed within several human lifetimes. This gradual nature of the changes in climate enables the plants, animals, and Microorganisms on earth to evolve and adapt to the new temperatures, precipitation patterns, etc. The real threat of climate change lies in how rapidly the change occurs. Increasing concentrations of greenhouse gases are likely to accelerate the rate of climate change. The Earth's climate has changed throughout history. From glacial periods (or "ice ages") where ice covered significant portions of the Earth to interglacial periods where ice retreated to the poles or melted entirely - the climate has continuously changed. Scientists have been able to piece together a picture of the Earth's climate dating back decades to millions of years ago by analyzing a number of surrogate, or "proxy," measures of climate such as ice cores, boreholes, tree rings, glacier lengths, pollen remains, and ocean sediments, and by studying changes in the Earth's orbit around the sun. In other words, some degree of climate change is irreversible. Scientists call this the "committed warming," and estimate that the Earth would continue to warm about 1 degree Fahrenheit (.6 degrees Celsius) even if greenhouse gas levels in the atmosphere stopped growing immediately. 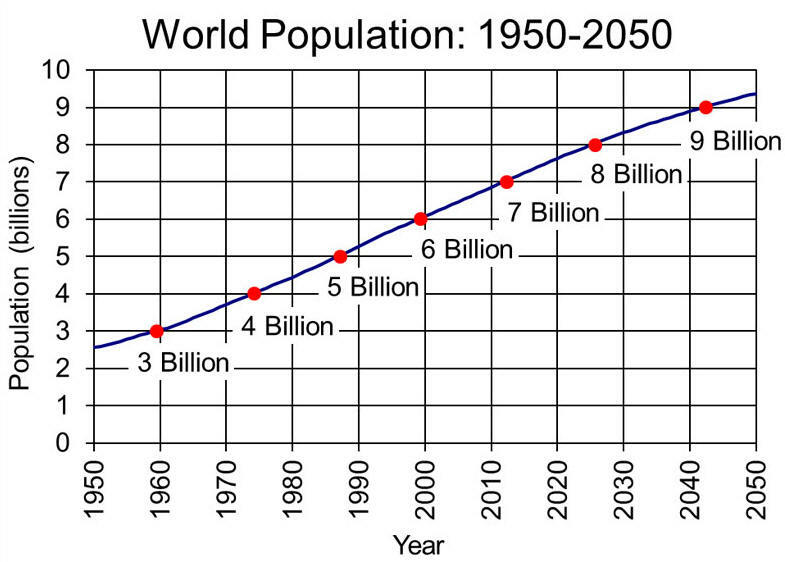 That is, if all human greenhouse gas emissions stopped tomorrow, the Earth would still warm for at least a half-century. Over the last 400,000 years the Earth's climate has been unstable, with very significant temperature changes, going from a warm climate to an ice age in as rapidly as a few decades. These rapid changes suggest that climate may be quite sensitive to internal or external climate forcings and feedbacks. 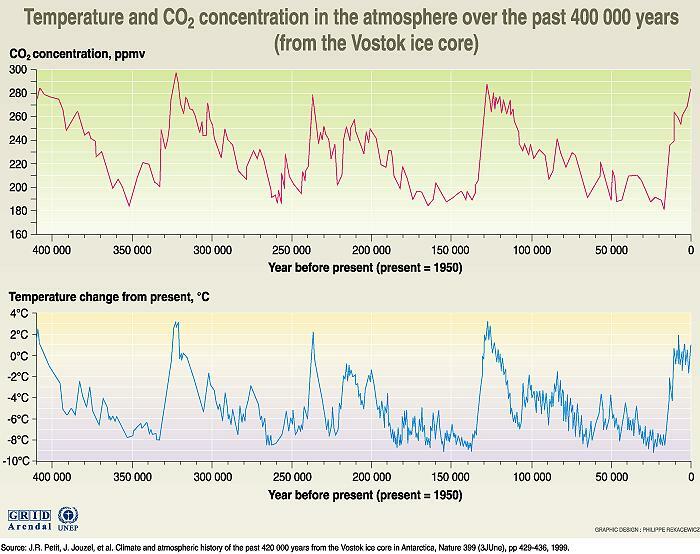 As can be seen from the blue curve, temperatures have been less variable during the last 10 000 years. Based on the incomplete evidence available, it is unlikely that global mean temperatures have varied by more than 1°C in a century during this period. The information presented on this graph indicates a strong correlation between carbon dioxide content in the atmosphere and temperature. A possible scenario: anthropogenic emissions of GHGs could bring the climate to a state where it reverts to the highly unstable climate of the pre-ice age period. Rather than a linear evolution, the climate follows a non-linear path with sudden and dramatic surprises when GHG levels reach an as-yet unknown trigger point. Changes in the Earth's orbit: Changes in the shape of the Earth's orbit as well as the Earth's tilt and precession affect the amount of sunlight received on the Earth's surface. These orbital processes -- which function in cycles of 100,000 (eccentricity), 41,000 (tilt), and 19,000 to 23,000 (precession) years -- are thought to be the most significant drivers of ice ages according to the theory of ,Mulitin Milankovitch a Serbian mathematician (1879-1958). Changes in the sun's intensity: Changes occurring within (or inside) the sun can affect the intensity of the sunlight that reaches the Earth's surface. The intensity of the sunlight can cause either warming (for stronger solar intensity) or cooling (for weaker solar intensity). According to NASA research, reduced solar activity from the 1400s to the 1700s was likely a key factor in the “Little Ice Age” which resulted in a slight cooling of North America, Europe and probably other areas around the globe. Volcanic eruptions: Volcanoes can affect the climate because they can emit aerosols and carbon dioxide into the atmosphere. Carbon dioxide emissions: Volcanoes also emit carbon dioxide (CO2), a greenhouse gas, which has a warming effect. For about two-thirds of the last 400 million years, geologic evidence suggests CO2 levels and temperatures were considerably higher than present. One theory is that volcanic eruptions from rapid sea floor spreading elevated CO2 concentrations, enhancing the greenhouse effect and raising temperatures. However, the evidence for this theory is not conclusive and there are alternative explanations for historic CO2 levels While volcanoes may have raised pre-historic CO2 levels and temperatures, according to the USGS Volcano Hazards Program, human activities now emit 150 times as much CO2 as volcanoes (whose emissions are relatively modest compared to some earlier times). Changes in ocean currents: The heating or cooling of the Earth's surface can cause changes in ocean currents. Because ocean currents play a significant role in distributing heat around the Earth, changes in these currents can bring about significant changes in climate from region to region. The Medieval Climate Anomaly: Between roughly 900 and 1300 AD, evidence suggests Europe, Greenland and Asia experienced relative warmth. While historical accounts and other evidence document the warmth that occurred in some regions, the geographical extent, magnitude and timing of the warmth during this period is uncertain . The American West experienced very dry conditions around this time. The Little Ice Age: A wide variety of evidence supports the global existence of a "Little Ice Age" (this was not a true "ice age" since major ice sheets did not develop) between about 1500 and 1850 . Average temperatures were possibly up to 2ºF colder than today, but varied by region. Prior to the Industrial Era, the Medieval Climate Anomaly and Little Ice Age had defined the upper and lower boundaries of the climate's recent natural variability and are a reflection of changes in climate drivers (the sun's variability and volcanic activity) and the climate's internal variability (referring to random changes in the circulation of the atmosphere and oceans). Precambrian time included almost all of Earth's first 4 billion years. The crust, the atmosphere, and the oceans were formed, and the simplest kinds of life appeared. Throughout the history of Earth, the climate has changed many times. Between 800 million and 600 million years ago, during a time called the Precambrian, Earth experienced several extreme climate changes called ice ages or glacial epochs. The climate grew so cold that some scientists believe Earth nearly or completely froze several times. The theory that the entire Earth froze is sometimes called the snowball Earth. Geologists estimate that Earth experienced up to four such periods of alternate freezing and thawing. Most of the time, Earth has been largely ice free. Brief ice ages occurred about 450 million years ago and again about 250 million years ago. In the last few million years, however, Earth's climate began to cool. Glaciers began forming in Antarctica about 35 million years ago, but the climate there was warm enough for trees to grow until about 5 million years ago. By about 2 million years ago, at the beginning of a time called the Pleistocene Epoch, ice had accumulated on other continents as well. Numerous separate ice advances, periods when ice sheets covered vast areas, occurred during the Pleistocene Ice Age. The advances alternated with periods when the climate was warmer and the ice melted. Geologists analyzing sediment deposits from the North Atlantic Ocean determined that there were at least 20 advances and retreats of ice sheets in the past 2 million years. At least four ice advances were big enough to extend over much of Europe, cover most of Canada, and reach deep into the United States. The most recent advance of ice began about 70,000 years ago and reached its farthest extent about 18,000 years ago. The vast glaciers and sheets of ice scoured out the basins of the Great Lakes and blocked rivers, completely changing the courses of the Mississippi, Missouri, and Ohio rivers. So much water was trapped in the form of ice that sea level around Earth dropped as much as 390 feet (120 meters), exposing parts of the present ocean floor. The most recent ice advance ended about 11,500 years ago. Most scientists believe that Earth is currently in an interglacial period, and another ice advance will follow. Scientists do not fully understand why Earth has ice ages. Most believe that tiny changes in Earth's orbit and axis due to the gravitational pull of other planets play a part. These changes alter the amount of energy received from the sun. Many scientists also believe that variations in the amount of carbon dioxide in the atmosphere are responsible for long-term changes in the climate. Carbon dioxide, a "greenhouse gas," traps heat from the sun and warms Earth's atmosphere. Most of Earth's carbon dioxide is locked in carbonate rocks, such as limestone and dolomite. Earth's climate today would be much warmer if the carbon dioxide trapped in limestone were released into the atmosphere. When mountains rich in silicate minerals wear down through weathering and erosion, calcium and magnesium erode from the rocks. These elements are carried to the sea by water. There, living organisms absorb the chemicals and use them to make protective carbonate shells. The organisms eventually die and sink to the bottom to form limestone deposits. This process, called the carbonate-silicate cycle, removes carbon dioxide from the atmosphere. With less carbon dioxide in the atmosphere to trap heat from the sun, Earth's climate may cool enough to cause an ice age. Limestone and dolomite deposits exposed to weathering and erosion return carbon dioxide to the atmosphere and contribute to global warming. In addition, some limestone on the ocean floor can be carried down into Earth's mantle by subduction. Beneath the crust, the limestone breaks down into magma under heat and pressure. The carbon dioxide in the limestone can then return to the atmosphere during volcanic eruptions. Scientists theorize that volcanoes continued to emit carbon dioxide into the atmosphere during the Precambrian ice ages. Eventually, the carbon dioxide warmed Earth through the greenhouse effect, causing the ice to melt rapidly. Climate can have a profound influence on human health both directly and indirectly. Some direct effects include deaths and illnesses related to excessive heat or cold exposure. Indirect effects of climate on health may involve respiratory disorders due to air pollution, including spores and pollens. Incidences of waterborne diseases, such as cholera, as well as food productivity and its relation to nutrition are other indirect effects of climate on health. Human health is also indirectly affected by climate due to its influence on the abundance and geographic distribution of disease vectors, such as mosquitoes and rodents. Several studies suggest projected climate changes may result in expanded geographic ranges for many mosquito-borne diseases. Mosquitoes can transmit many viruses, over 100 of which are known to infect humans. These include malaria, dengue fever, yellow fever, and severe and sometimes fatal encephalitis and haemorrhagic fever.